Round trip for the buffer. Drawing Machine TYPE 4 (Crimes of Futility No. 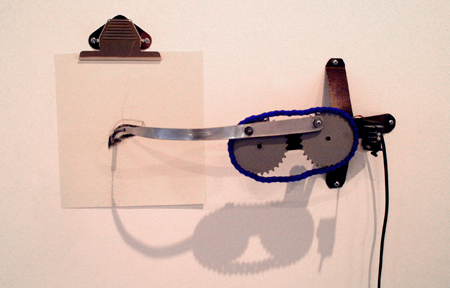 6) the prototype for the ArtistMachine*. One of a species, a genotype of little mark-making machines. TYPE 4 produces TIGHT CIRCLE WITH POINTED BASE AND LEANING TO ONE SIDE possibly exhibiting some sexual associations or a similarity to some internal bodily organ; up to 30% variation within type. Recomended Production Colour #000000 black. Profound, individuated, expressive this mark is about the deepest stirrings of the human soul in the face of the Void. *an unstable, erratic and deeply needy machine unfit for unsupervised general release: see menu item "Crimes of Futility No.7: The Artistmachine" above.